What has Myleene Klass and HRH Kate Middleton got in common – they both had lingual braces to straighten their teeth invisibly. Hidden braces are placed on the inside of your teeth, so you get the benefits of conventional braces without people knowing you are having braces. More and more of our patients are opting for this system with our Orthodontist. Only an Orthodontist with further training can provide this treatment, at Carisbrook our Orthodontist is experienced with this system. As the Lingual Braces are custom made for you they are thin and contoured to your teeth, therefore they are comfortable and do not affect your eating ability or speech. Kathryn was unhappy with her smile. 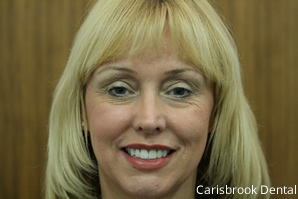 She underwent a course of fixed invisible braces with our orthodontist. 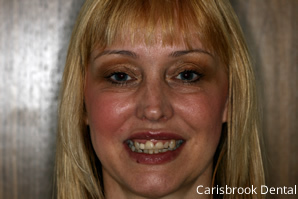 Following this Dr Idrees bleached her teeth with the Enlighten system and veneered her front upper four teeth.